Years of organizing within the Civil Rights Movement led to the eventual passage of the Civil Rights Act of 1964, with Title VII containing prohibitions of discrimination in the workplace on the basis of race and other protected classes. This accomplishment provided tools for the enforcement of illegal discrimination laws and has reduced many explicitly discriminatory behaviors over the past half a century. However, racial inequities continue to persist across all indicators for success in the United Sates. For local and regional government focused on achieving racial equity in our communities, “walking the talk” within one’s own institution and workforce is an important place to focus. OUR GOAL: the workforce in local and regional government reflects the diversity of the communities we serve. This diversity should exist across the breadth (functions) and depth (hierarchy) of government. 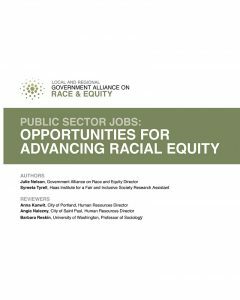 This issue brief from the Government Alliance on Race and Equity provides a common approach to furthering the field of practice of workforce equity within government.